Orlando, Florida – Just four months after being appointed Orlando Police Chief, Puerto Rican Orlando Rolón has launched a plan that seeks to maximize employees’ efficiency, bolster community ties and speed the process to fire officers as soon as a crime is detected. Born in Bayamón, his parents brought him to Florida when he was 11. Like many other families, they came to “the promised land” looking for a better opportunity and a suitable environment to raise children. Although this was more than four decades ago and he has lived in Florida for most of his 54 years, Rolón proves that his love for Puerto Rico is tattooed on his skin. In his office at the Orlando Police headquarters, Rolón has a map of Puerto Rico. It’s one of those old brown maps, with imperfections, showing some taíno villages. It’s hanging on the wall to the right of his desk, ready for a nostalgic glaze. After 26 years working at the Orlando Police Department, it was natural for this “Bayamonese” to aspire for the highest position in the Police. Although there had never been a Hispanic chief in the Orlando Police Department, Rolón – who has the same name as the city he is now protecting – decided to take the challenge, encouraged by his Venezuelan wife Georgina Rolón, and he succeeded. Being Puerto Rican is a great value for this six-foot-tall man’s qualities, and it is an ingredient that allows him to navigate in the Anglo-Saxon culture in which he grew up, while successfully moving in the Puerto Rican, the leading Hispanic group in this state. Rolón will go down in history as the first Puerto Rican to lead one of the largest departments in the entire United States, but Orlando Mayor Buddy Dyer will get a spot in the books for naming him. "In the process of evaluating candidates, I presented my ideas and the mayor determined that I was the one," he said. A tall officer with his uniform covered in badges, Rolón could intimidate, but nothing is further from the truth. His Puerto Rican Spanish gives him that typical and soft Puerto Rican “cantadito” (accent). From time to time, he smiles, and he never stops looking into the eyes of his interlocutor. In fact, in just three months, he appointed his team and launched a management project to maximize operations in this headquarters, that not only serves one of the most populated cities in Florida, but also works with the millions of tourists who come here looking for entertainment. First, he adjusted shifts so that most employees would be available at peak times and has invested in technology to maximize the use of electronic platforms that allow citizens to send the nearest officers to respond to citizens calls. In addition, he is implementing a program called "Real Time Crime Center", which allows to analyze crime incidence through technology and security cameras so that crimes can be addressed while they are being committed. He also added an idea he saw in Atlanta which allowed the police there to establish partnerships with communities and the private sector to create entities that collect money and resources to offer training, provide services and even establish community facilities. Rolón oversees 828 police officers and 250 administrative employees. His range covers 117 square miles and 285,000 inhabitants, which are part of the one million residents who in Orange County, where Orlando is located. But 72 million tourists who visit the area each year and require the attention of this body join this picture, said the officer, who easily speaks of figures, as if they were his birthdate. "I feel incredibly proud to be here, especially being Puerto Rican and Latino. 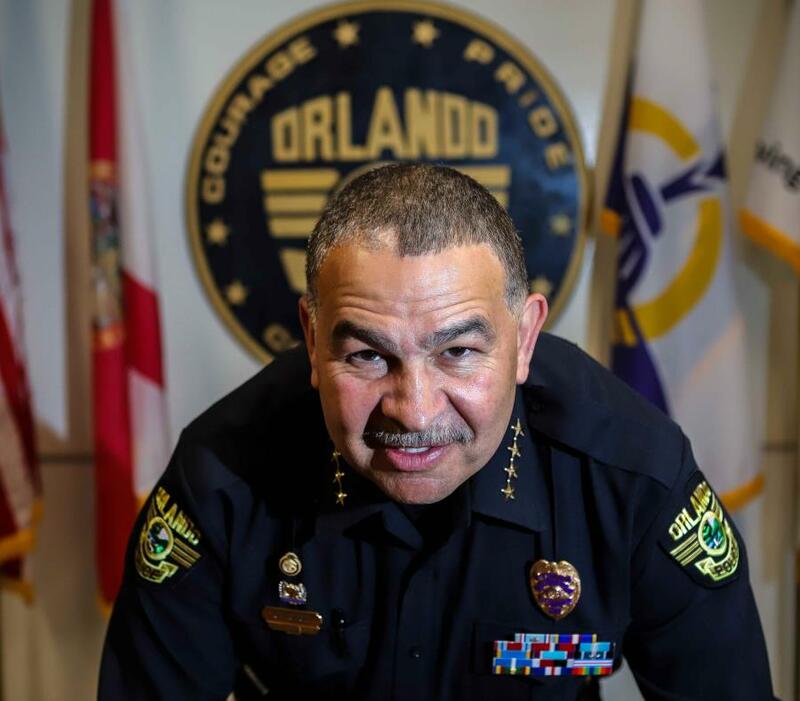 And every time one opens a door, we can show the world that we are prepared and available," he said and recalled that last October when his name as new Orlando Police Chief was announced and after he was sworn in December 2018, he received so many messages that his phone collapsed. Do you feel that being Puerto Rican could have been an element in your appointment since you would lead an agency that operates in a place where Puerto Ricans are the majority-minority population? - I'm sure that went through the mind of the mayor. Now, for every position I applied, I always had to give 100 percent. Not 80 or 90 percent. That was not enough. I always did more than what was expected from me and this is something that should apply to all Latinos. It is striking that half of the City of Orlando’s budget goes to security. In fact, being an officer in these agencies entails excellent salaries, benefits, equipment and training. This explains the low rate of resignations, in contrast to the number of those who want to join the force. Every year, there are 5,000 applications, however, only half go through a second evaluation process and only between 50 and 80 get the job, he explained. Although Rolón is proud of his identity, he is convinced that the strength of the Hispanic people here will be greater if, instead of seeing themselves separately as Puerto Ricans, Venezuelans, or Dominicans, they think of themselves as a strong Hispanic block.